"Anti" Bastille Day Party. Photo credit: Patricia Chang Photography. And so it was… the “Anti” Bastille Day Party. On the 14th of July, after celebrating the birth of America America’s independence for 10 straight days of pure unadulterated red, white and blue joy, the official “period” of this week(+) binge found itself at the end of an evening celebrating the French more America. In collaboration with San Francisco supper club, the Stag Dining Group the Noble Rot hosted the “Anti” Bastille Party. Why? Because last year we hosted a “Pro” Bastille Day Party, and frankly, it was much more fun to drink California wines this time around. Not that I don’t love the French, because I’ve spent my share of breezy summer afternoons strolling along the Seine, but because I love the French so much I couldn’t bare the thought of acting like them on their high holy day. Instead… the Stags and I devised a hell of an evening that caught the attention of the San Francisco Chronicle (<article). “Anti” was mean to be taken lightly – in jest – and the real theme was in no way against the French, it was simply a reinterpretation of them. 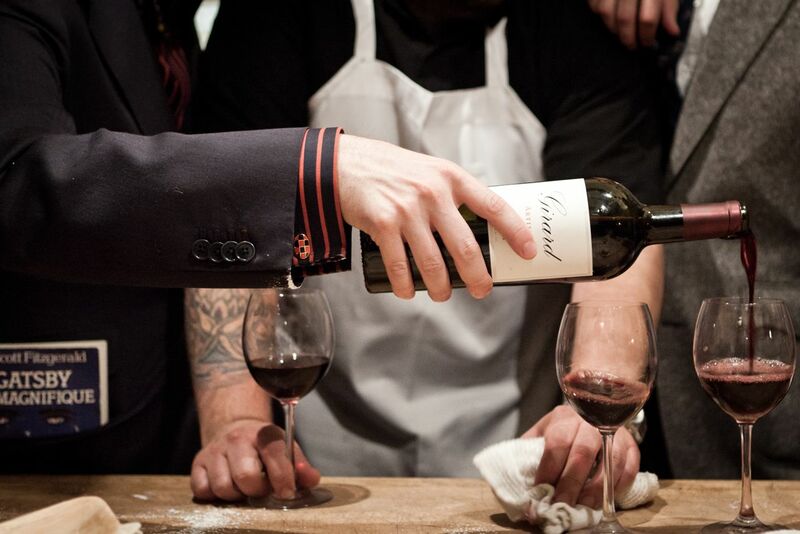 And so we served “Bordeaux” blends and “Meritage” blends from two delectably notable California-Americano wineries: Girard Winery and Cosentino Winery. The lovely French-sounding, assistant winemaker from Girard, Jacqueline Bahue (no relation to the French), joined us for the evening to impart a sense of vino-nationalistic pride and legitimacy. Sporting a fashionable dress she was the most charming assistant winemaker a Self-Appointed Master Sommelier could ask for. She worked the crowd like a pro and was full of wonderful bits of Girard and Cosentino history. Jacqueline Bahue, Assistant Winemaker, Girard. Photo courtesy of Girard and Cosentino Winery. A cocktail hour curated by The Cocktail Lab (Timothy Zohn and Anne Sauer) went ahead and impressed the hell out of everyone. The spirit at hand was an American-craft distilled whiskey dubbed “Double & Twisted Moonlight Whiskey” made from … already bottled IPA. You should’ve been there to experience this fine, fine, fine clear whiskey from Master Distiller Marko Karakasevi from Domain Charbay. There was nothing to be said; the sighs of pleasure permeated as the cocktail hour made way for socialist activity and dissenters, some singing Francophilic songs, reveling in the glory and honor of the after-feeling of one of the best cocktails they ever tasted. Combine all ingredients with ice and shake vigorously. Double-strain into an ice-filled glass and garnish with a fresh sprig of mint. At the sound of a gong, the next wine was introduced followed by a food course to pair. 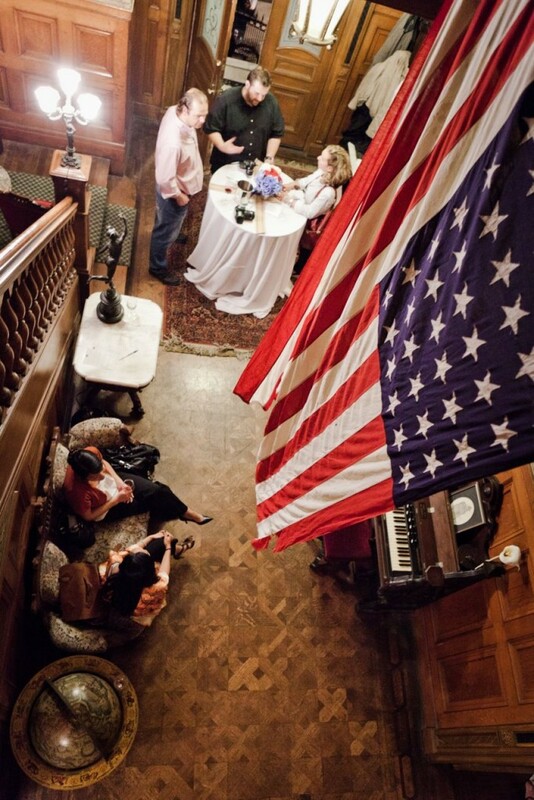 The evening’s guests were ravaged with patriotic delight and in true American-fashion resisted the threat of education! Sadly for them, they still fell prey to factual information and in the end knowledge was indeed imparted. 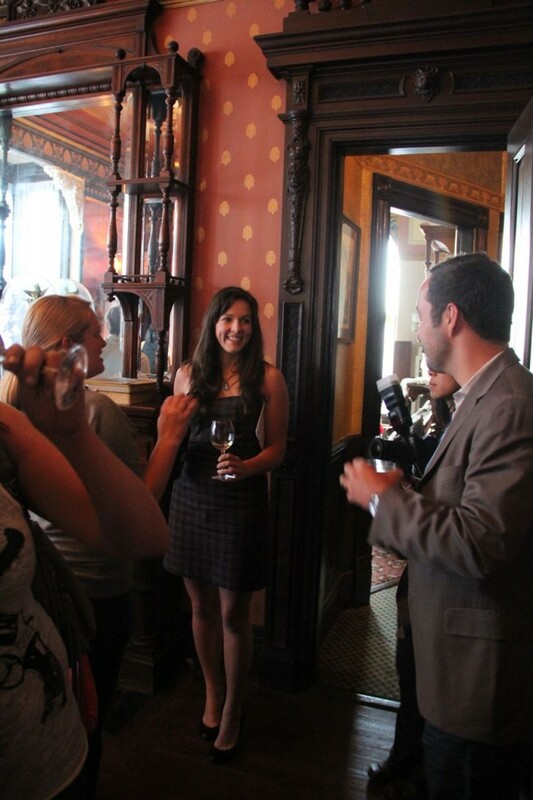 We learned how to pronounce “Meritage” (Merit-IH-dge) and how to taste wine in the proper fashion (pinky out). Debates broke out concerning which American cigarettes paired best with the selected wines and Americano-inspired dishes. True excitement was had by all in that we experienced a “vertical” tasting (winespeak for: same wine, different vintages). The taste profiles of the ’05 and 06 “The Poet” was palpable! The ’06 seemed a distant cousin to the ’05, showing brighter fruit and silkier tannins. The Girard ’07 was rounder with a succulent mouth-feel counterpart to the tougher, younger tannins of the ’08. What a great experience. And as a little surprise in the end, we uncorked this incredible wine. 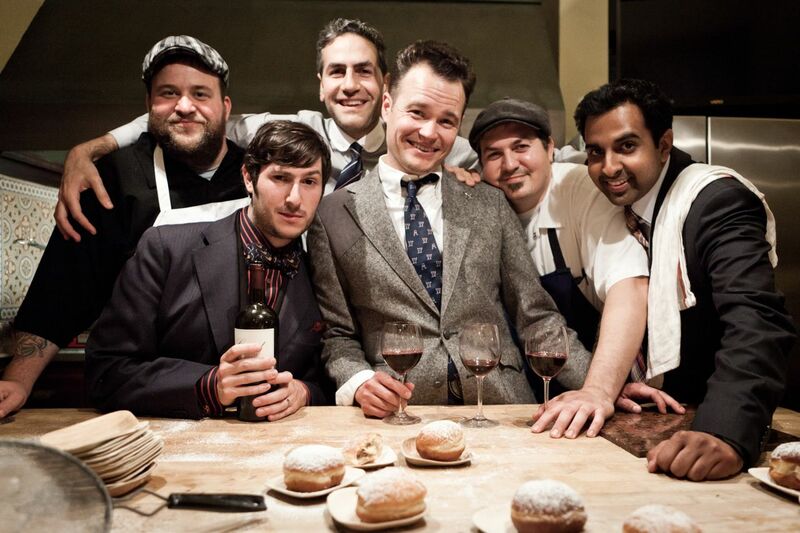 The Noble Rot + Stag Dining Group = America2.0 (Left to right: Jordan Grosser, Jonny Cigar (Noble Rot), Emory Al-Imam, Matthew Homyak, Ted Fleury, Anil Margsahayam) Photo Credit: Patricia Chang Photography. And Look: in the end, everyone threw a Bastille Day party, okay? Everyone. For crying out loud. But. But? But! No one did what we did (and I’m referring of course to the after-party, the details of which, I canna’ discl’se). I have to extend a supremely sturdy and gruff handshake, round of applause, the raising of many glasses to Stag Dining Group. These Stags run a tight ship and the experience is truly memorable. Chef Jordan Grosser and Ted Fleury are superbly talented cuisinists. Matthew Homyak, Anil Margsahayam and Emry Al-Imam are the best front-of-house friends a wino could have. Truly Stag. I salute you – thanks a million Stags over! Let us all pick up our American rifles and rifle the belly of the whale. Wine, I say! More wine. Tags: Anil Margsahayam, Anti Bastille Day, Artistry, Bastille Day, Bordeaux Blend, Cosentino Winery, Emry Al-Imam, Erin Luby, Girard Winery, Jacqueline Bahue, Jonathan Cristaldi, Jonny Cigar, Jordan Grosser, Le Rêve Américain (The American Dream), Matthew Homyak, Meritage, Noble Rot, noblerot.com, San Francisco, Sarah Tenthorey, Stag Dining Group, stagdining.com, Ted Fleury, The Noble Rot, The Poet, traveling wine saloon, underground supper club.